I’m in the Caribbean again. This time while Diana is at home working to keep me in the manner to which I would like to be accustomed, I’m sailing with three buddies to race in the Antigua Sailing Week regatta. We decided to expand the outing and add open ocean sailing. 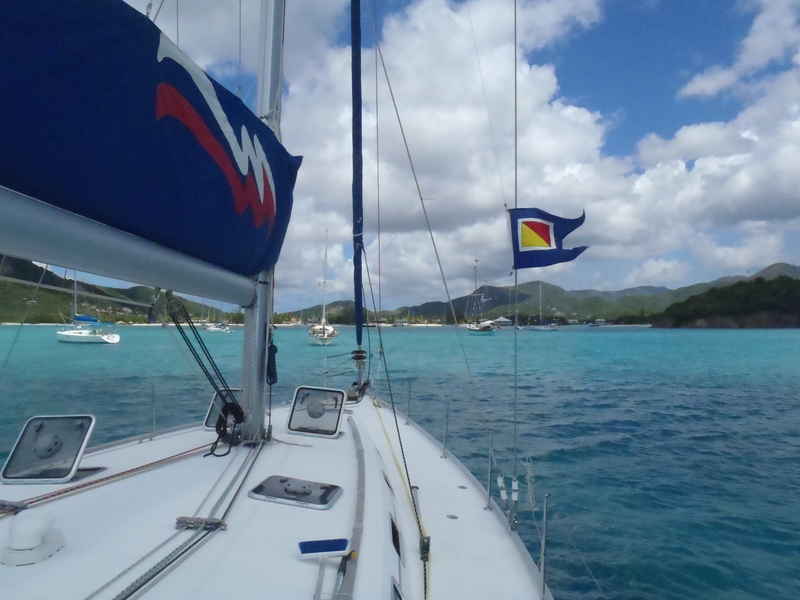 We flew to Tortola to get our boat, a Beneteau 50, and sailed from there to Antigua. That sounds ambitious until our 180 mile route is compared to the yachts that came in from Europe, South America, and other far-away places. 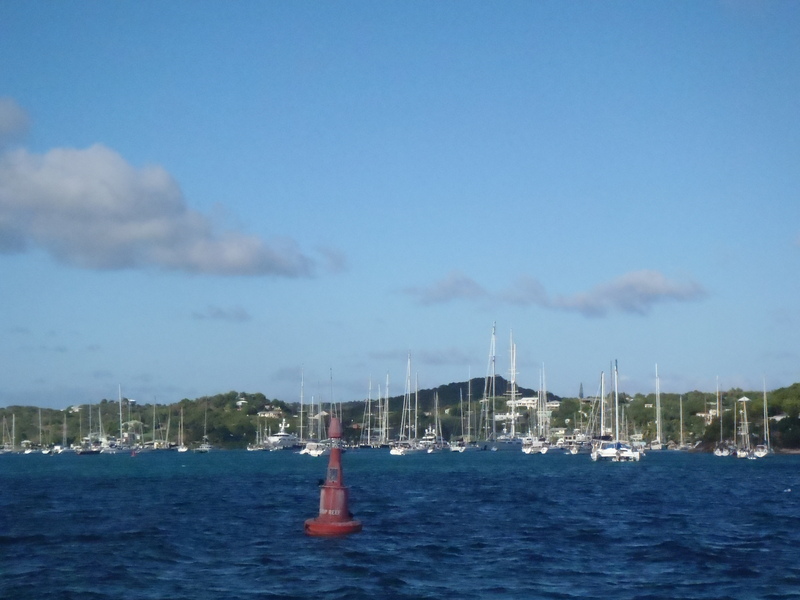 We arrived at Jolly Harbor on the western side of Antigua just after dark on Wednesday. It’s usually better to arrive and set anchor during daylight, but I was familiar with that harbor from being there last April and I’ve got excellent navigation software. We spent a peaceful night there and then on Thursday morning we did some work on the boat to prepare it for racing. We are sailing in the Bareboat Division. Since our boat is usually just used for cruising, it wasn’t fully prepared for racing. The mainsail had lost all five telltales, and a hole that had been patched was open again. Fortunately I had gotten some sail patching cloth and some material to make telltales at the sail loft at the Moorings/Sunsail base. So we added those things and adjusted some of the standing rigging to give the sail a better shape. Yesterday we sailed from Jolly Harbor to Falmouth Harbor as sort of a practice and tuning drill. We will do some more of that today. 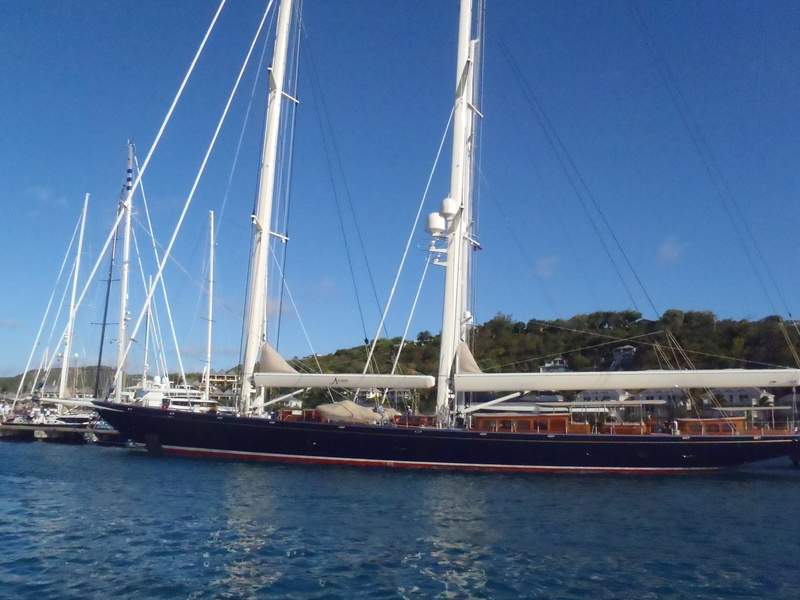 Falmouth harbor is crowded with super sized sailing yachts, many of them over 100 feet long. There are at least 2 that are over 200 feet long. One of them has a navy hull, a red and a white water line stripe, and lots of varnished teak and mahogany above deck. What a beauty! We will do some practicing today, then at 8:00 a.m. on Saturday, our first race starts. It goes completely around Antigua, about 55 miles. The races on the next days will be more traditional races around markers and they will be shorter. More to report to you later.